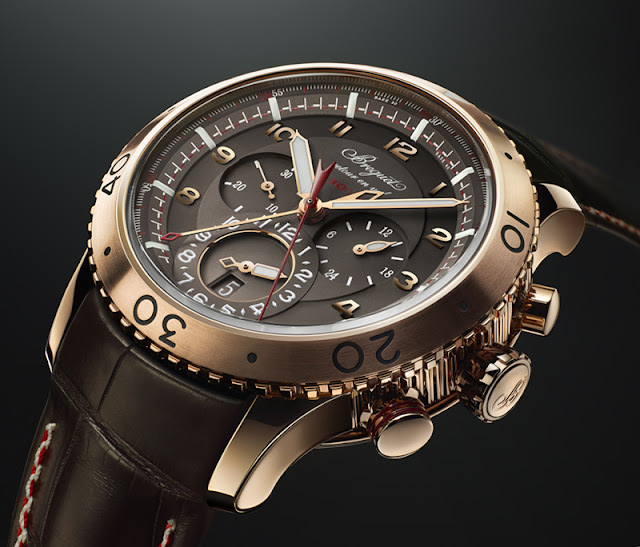 Breguet's Type XXII product line sees the addition of a new rose gold version of this remarkable chronograph with flyback function and second time-zone. The 44 mm superbly refined case, characterized by the round-ended horns and the two-way rotating bezel, houses a self-winding chronograph movement with silicon escapement and flat balance spring whose frequency has been raised to an impressive 10 Hertz (i.e. 72,000 vibrations per hour) determining a lower percentage of irregularities to the rate. At the heart of this technical exploit is the use of silicon, resulting in more lightweight mobile components and the avoidance of the lubrication problems generated by high frequencies. The chronograph seconds hand effects a complete rotation in 30 seconds. The minutes graduation in the form of dashes – one red and the other white – situated on the flange, combined with the numbered seconds graduation also appearing in red and white, serves to establish whether the chronograph counter is in its first (red sectors) or second (white sectors) 30-second revolution. 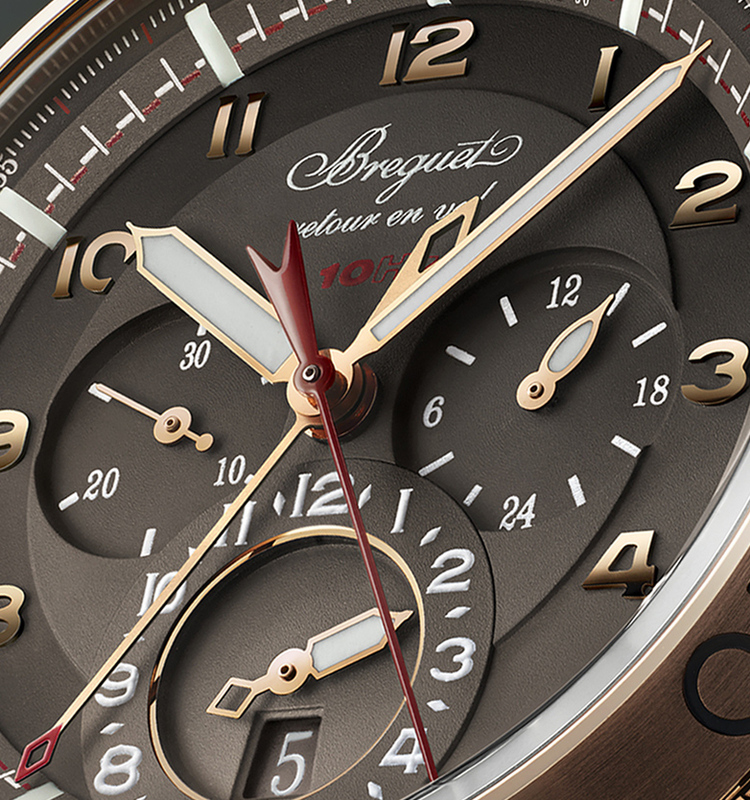 The Breguet Type XXII chronograph features a flyback function, allowing the totaliser to be returned to zero and instantly restarted in just one operation. 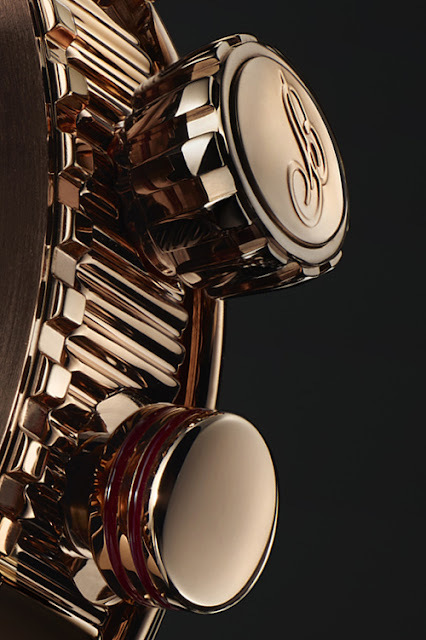 At 6 o'clock, the dial includes a second time-zone indicator along with the date aperture. A two-position crown resets the second time-zone indicator by moving the hour hand without affecting the minute hand. A 24-hour night-and-day indicator at 3 o’clock tells the wearer whether it is daytime or nighttime in the area covered by the second time-zone. At 9 o’clock, a sub dial shows the running seconds making full rotations in 30 seconds. The Type XXII is water-resistant to 10 bar (100 m).